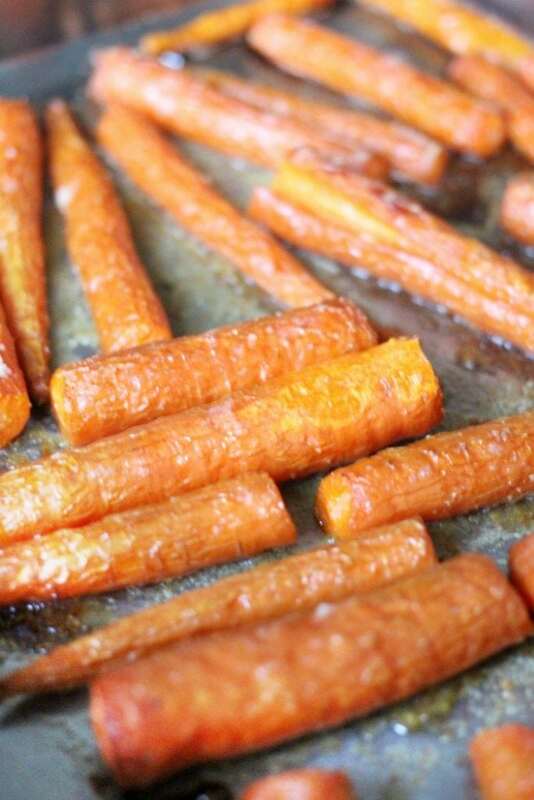 Roasted carrots is one of my family’s absolute favorites. 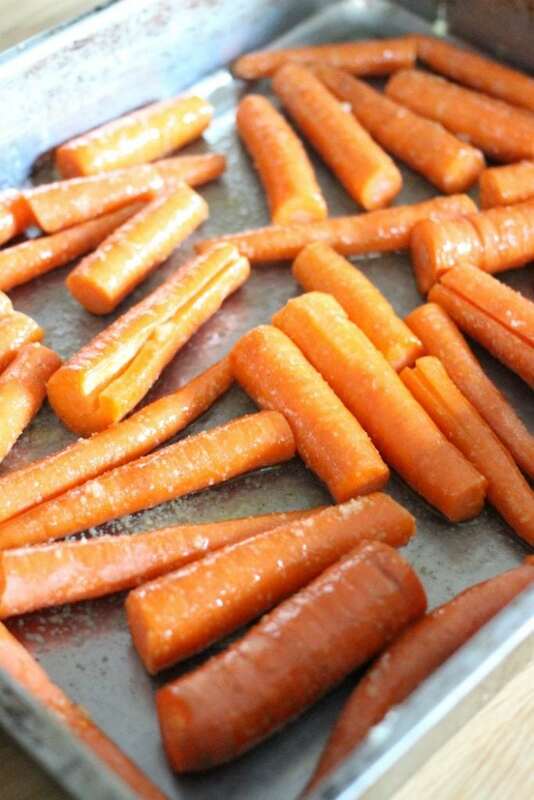 Just roasted carrots, garlic, and butter make delicious easy oven baked carrots. 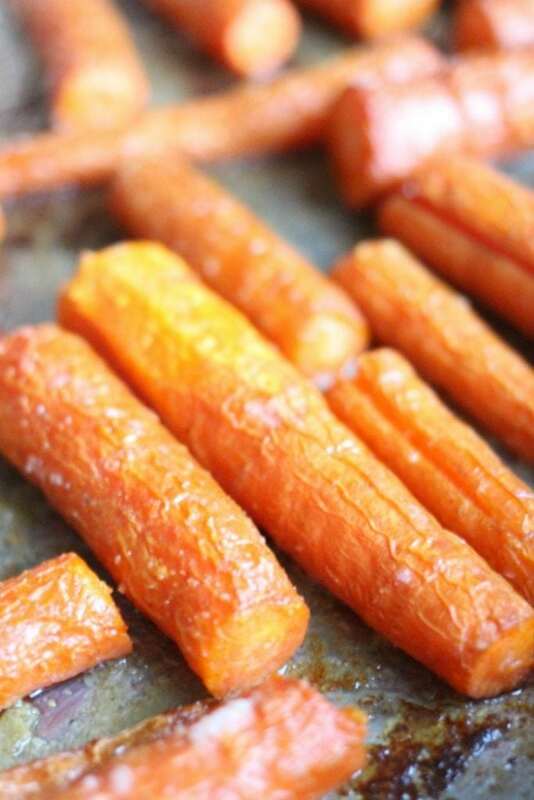 This roasted carrots recipe is the perfect solution to get you out of your dinner vegetables rut. I don’t know about you, but I find myself alternating canned green beans and microwaved broccoli all too often. 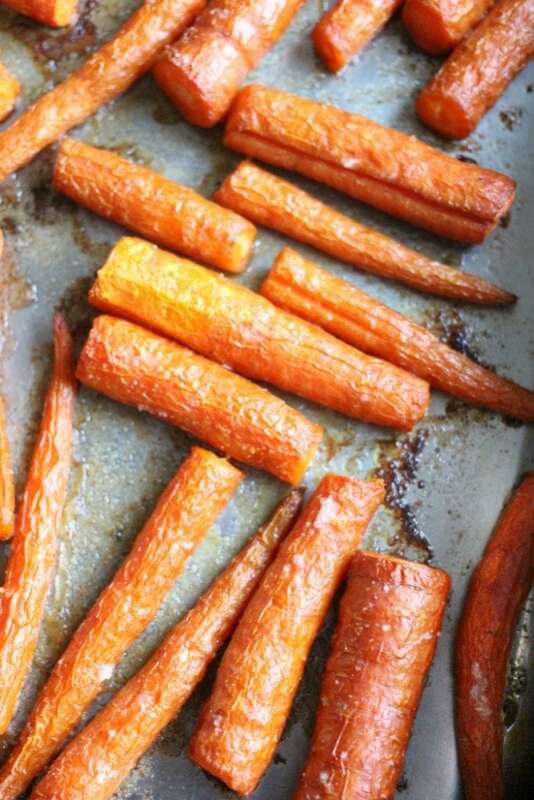 Carrots baked in the oven with garlic and butter are such a simple way to change things up and still please the whole family. My kids absolutely love them! 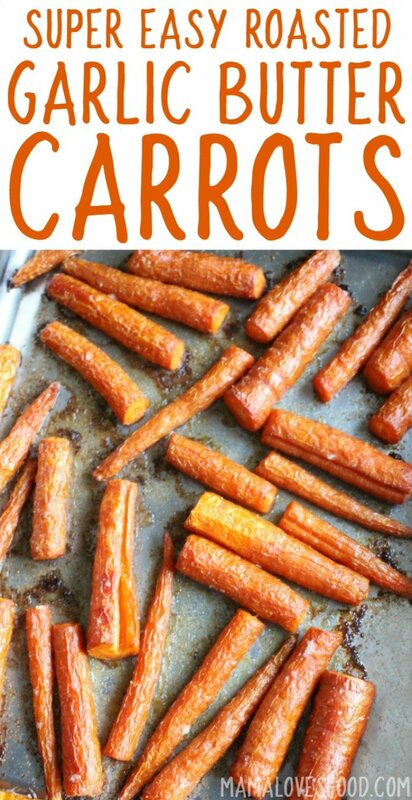 Use whole carrots or baby carrots, whichever is easier for you! 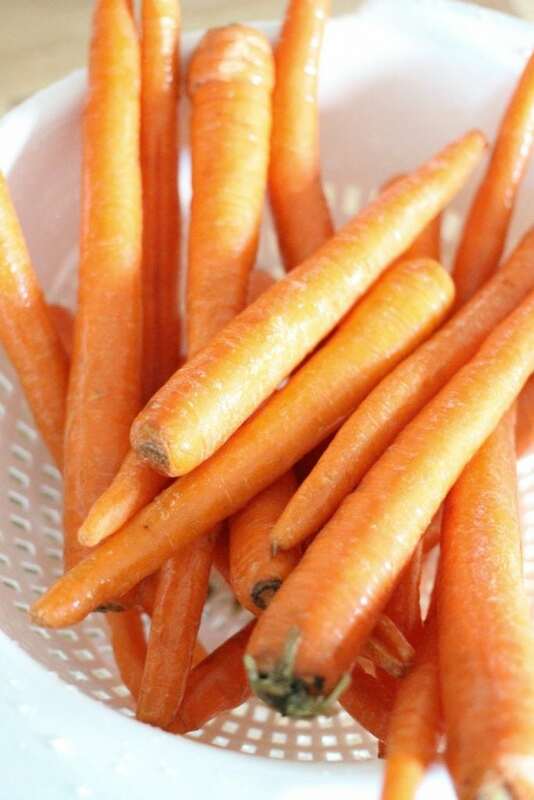 And here’s a secret – I never peel my carrots. Or my potatoes, for that matter. Just give them a good scrub sinkside and you’re all set. 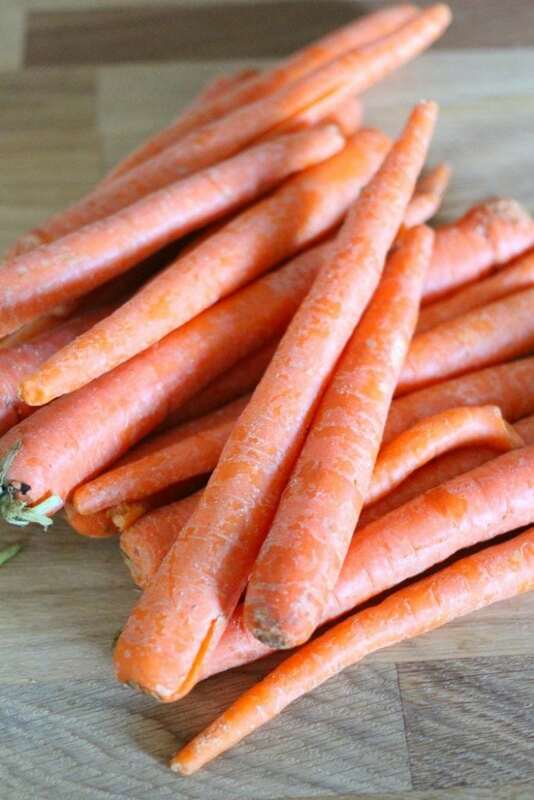 This recipe is so easy, we’ve even taught our ten year old how to cook carrots in the oven. While we skip peeling the carrots, I do cut the ends off. Not because they’ll hurt you if you eat them (you’ll be fine! ), but because my kids squawk if I don’t. Choose your battles wisely folks. Carrot ends are not worth a tantrum in my mind. Hah! 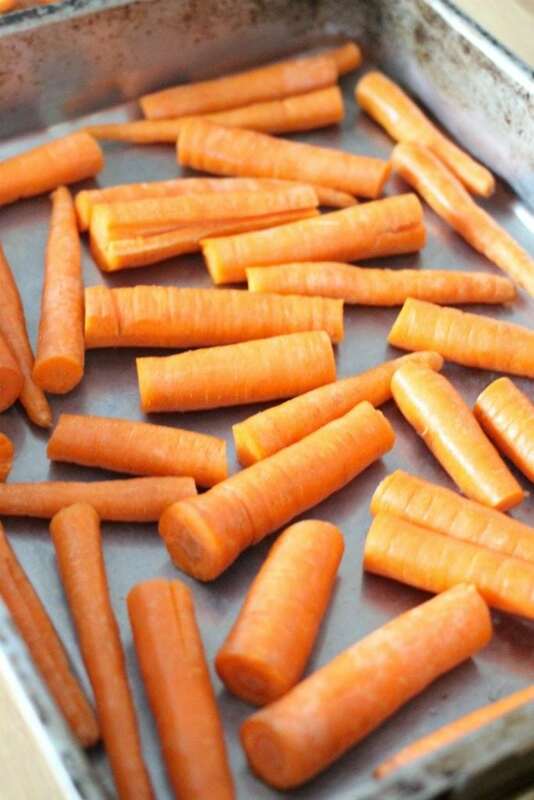 If we’re using whole carrots for the garlic roasted carrots recipe, then I’ll also cut them down into halves or thirds. Just to make serving and eating easier. 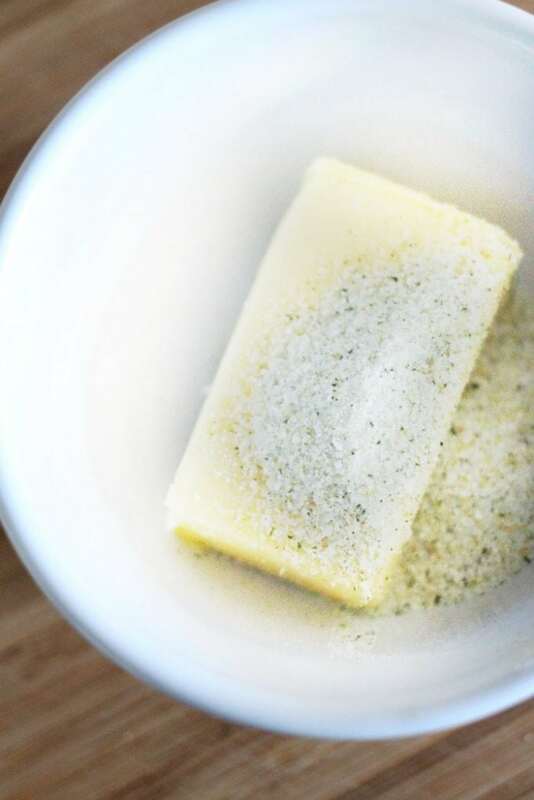 This recipe will taste delicious no matter the butter you use, but I’d be lying if I didn’t admit to being a total butter snob. Pretty much anything else I’ll take the off-brand, but when butter is one of only three ingredients to a recipe, I feel like choosing a high quality butter is important. I’m partial to a good European butter with low water content. Mmmmmm. If you’re dairy free, then just sub in some clarified butter or ghee! 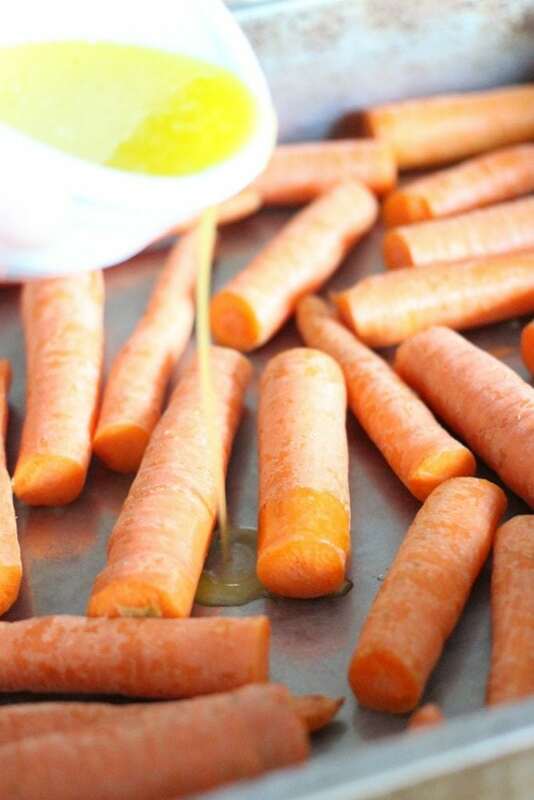 If you’d like to use fresh garlic for our garlic butter carrots recipe, then by all means, please do. But we’ve found garlic salt does the trick just fine. I like the garlic salt with that has dried parsley flakes in it. Green is pretty, yo. 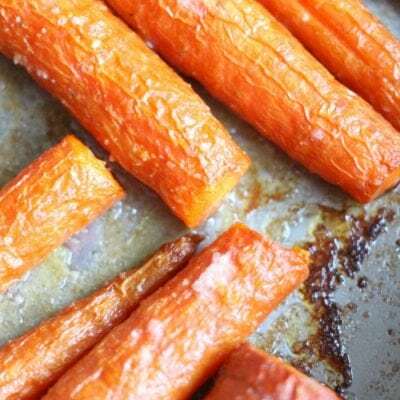 If you’re serving the carrots to a crowd and want it fancier looking (although, really, what’s prettier than a vibrant orange tray of perfectly roasted oven carrots slathered in butter and garlic?! ), chop some fresh parsley and sprinkle it over top. Green is pretty, yo. No, but really. I love the color green. Nordic Ware Natural Aluminum Commercial Baker’s Half Sheet – I have about a half dozen of these and would gladly buy more. A bakers half sheet is an absolute kitchen staple for everything from roasted veggies, to sheet pan dinners, and of course cookies! Lawry’s Garlic Salt With Parsley – I put this garlic salt on pretty much everything. It’s my favvvvvorite. Obviously fresh garlic is fabulous. But let’s be reasonable here, we’re working adults. Fresh garlic isn’t always going to happen. White Porcelain Serving Dishes Platter – I’m a firm believer that food looks prettier on a white platter. Maybe I’m nuts (definitely), but I love a nice clean white platter! And check out all of our live cooking shows! 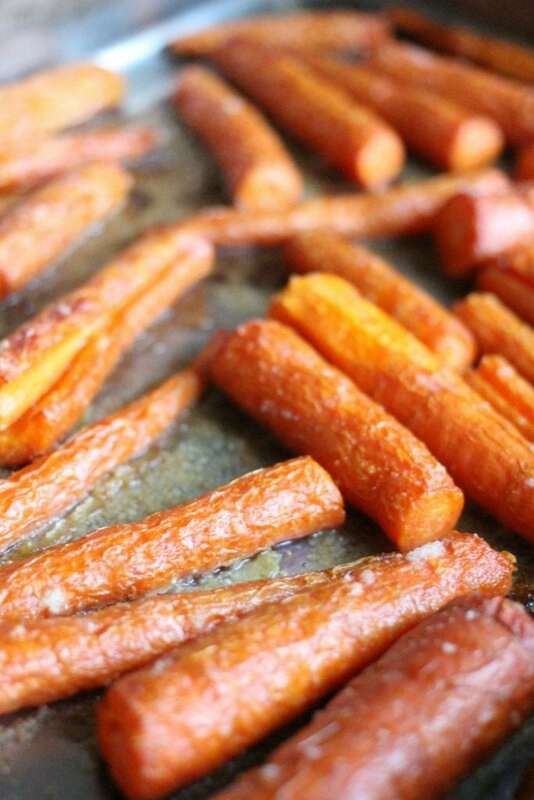 This roasted carrots recipe is one of my family’s absolute favorites. 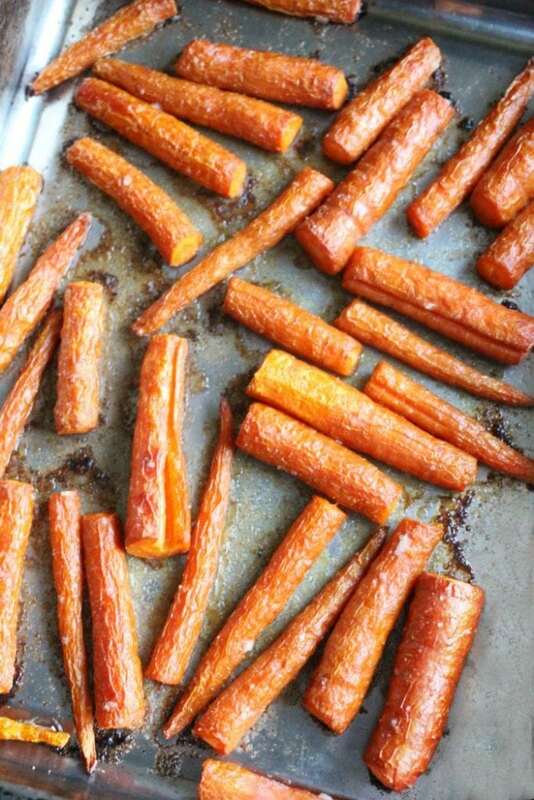 Just roasted carrots, garlic, and butter make delicious easy oven baked carrots. Rinse carrots well, and remove icky ends. 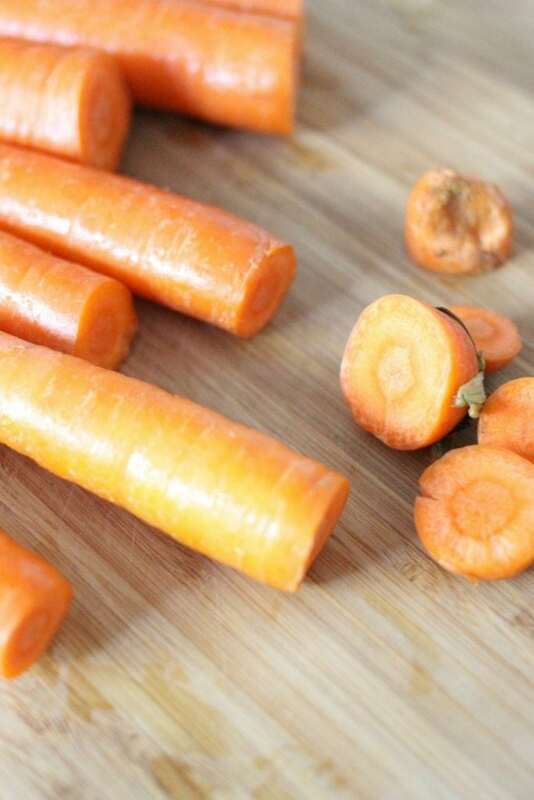 Slice into halves or thirds (if you're using whole carrots). Spread over baking sheet in a single layer, and drizzle with melted butter. Toss to coat. Sprinkle liberally with garlic salt and bake on middle rack of oven at 425 degrees for approximately 30 minutes, until they are tender to your liking. I made these carrots for my family a few days ago. And they were a hit. So yummy and tender. A good side dish idea is gold! 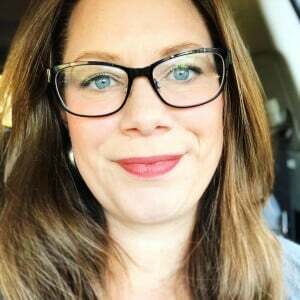 Love the tips in this post! It’s a fabulous recipe either for entertaining or just regular family meals. I have a feeling my toddler will love these! We just LOVE roasted veg!! I do it all year round. In the winter obviously I use the oven, but in the summer I get the outdoor pizza oven going and cook them out there! 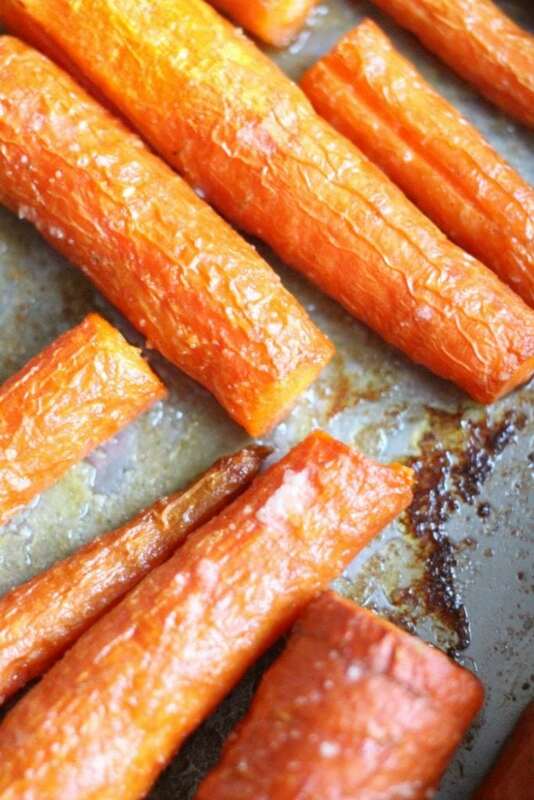 These roasted carrots look perfect. I am excited to add them to our dinner. love it! they’re one of our favorites too. the onions are a genius idea!